Michonne (Danai Gurira) takes a moment to contemplate how fucked this is. Still, seeing Michonne in the middle of a pile of dead kids, with one kindergartener looking on with a knife in her hand while trying to decide whether to murder her fellow kids or run, is cuckoo bonkers banana pants, and it is deeply absurd that is the level the show has reached in order to pull out more genuinely traumatizing moments for these characters after all the nightmares they’ve been through. I don’t know if I’m in a really good headspace or a horrible one, but I grinned my way through this lunacy. In a sense, it’s perfect Walking Dead—a woman totally committed to teaching children to survive in this harsh world who has somehow completely forgotten that survival does not mean “kill other people even at cost to your own life.” And thus Jocelyn joins that great pantheon of TWD characters who had always been looking for a chance to go completely insane and just happened to luck out when the zombie apocalypse hit. 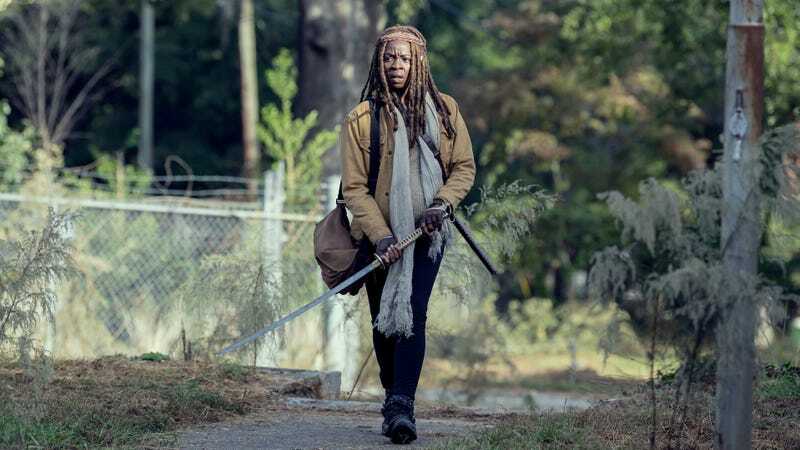 Connie does not apologize to Michonne for bringing Lydia to Alexandria in order to get Henry medical attention, although she does tell her she wishes she had better shoes. Connie’s pretty great.